With all of the floor covering options out there, choosing the right one for your home or office can be overwhelming. 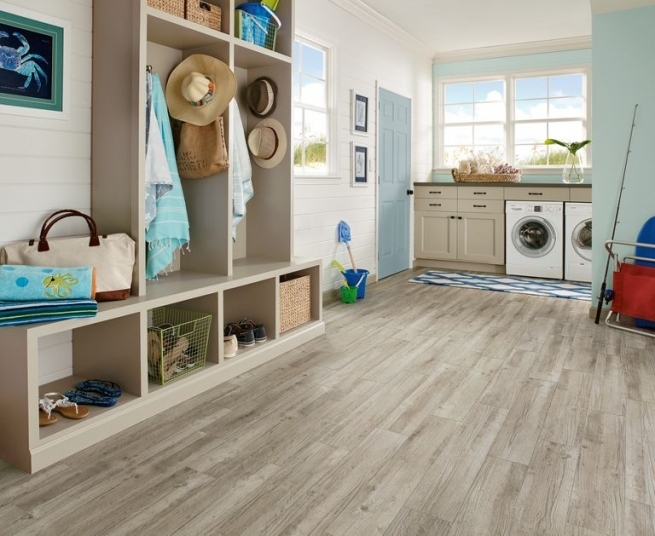 One question our clients frequently ask: “Laminate versus Luxury Vinyl Plank? Which is better?” Let’s take a look at the pros and cons of these two different floor covering types. Laminate flooring has been on the market for decades. It is a well-known and low-cost hard surface flooring option. Laminate is made up of four layers, three of them are visible to the naked eye. The base is typically made of a dense fiberboard. The second layer is the core made of melamine resin blended with wood fibers and compressed. The core is topped with a printed applique much like a photo out of a laser printer. This is the layer that gives the floor its wood look. The applique is then sealed with a polyurethane wear layer that protects the image from damage. While the underlying structure is the same, not all laminate is created equal! 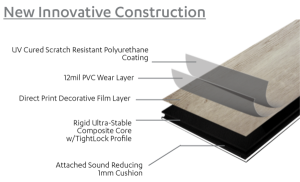 The overall thickness of the product, thickness of the wear layer, and the installation mechanism (tongue and groove) all greatly impact the durability and performance of the floor. Low-Cost. Laminate is a very cost-efficient hard surface floor choice. Ease of installation. Contractors and DIY homeowners alike enjoy the straightforward installation of this floor. “Real Wood” look and feel. A good quality laminate will give the look and feel of a hardwood floor without the price tag. Durability. Laminate varies widely in quality. The least expensive options are typically more prone to scratches, gouges, and discoloration. Not Waterproof. There are now laminates on the market that boast 24 hour spill protection. Please note, this is for top spills only. If there a leak from your dishwasher, water heater, or sink, the laminate will swell and split. The floor and any water damaged subfloor must then be removed and replaced. Laminate cannot be repaired. Damage of any kind is not covered under the manufacturer’s warranty. Luxury Vinyl Plank (LVP) or Luxury Vinyl Tile (LVT) is a vinyl composition product made of either several compressed layers of PVC and fiberglass. LVP also features an applique design layer with a protective polyurethane wear layer. The overall thickness and wear layer impact the durability and longevity of the product. New to the luxury vinyl family is Vinyl Composition Core (VCC) or sometimes called Water Proof Core (WPC) These products feature a resin composite core which provides stability and an overall thicker product, up to 7mm. Water Resistant or Waterproof– This is the main reason LVP is an increasingly popular option. It performs well in wet areas such as kitchens and bathrooms and exterior-facing entries such as foyers and lobbies. LVP can go places real wood and laminate can’t. Durability- LVP is typically very durable and scratch-resistant. Thicker wear layers and emboss and register texturing featured on higher-end products make for a top-performing floor that is suitable for home or light-commercial applications. Ease of Installation– Just like laminate, this product is simple to install. Costs less than tile-Luxury vinyl tile is a great option for people that want the look of tile without the maintenance or cost, but also do not want traditional sheet vinyl or linoleum. Look and Feel– Luxury vinyl plank has come a long way in recent years. Advances in printing and texturing technology have produced more “true-to-wood” visuals and grain texture. This is especially true of higher-end products. However, some folks will complain that it still just feels like vinyl. Costs more than laminate- Like most products, cost varies widely and is largely dependent upon the overall quality. However, a quality LVP will typically cost a little more than a comparable laminate. In conclusion, the debate of laminate versus luxury vinyl plank, there is not a clear winner. Each floor covering has features and benefits that make it appropriate for different situations. Still need help deciding? Visit an Area Floors showroom and one of our experienced sales people will help you find the right laminate or luxury vinyl product for your next project! Evoke, Armstrong, Pac Mat, Moduleo, Tandem, TAS Home, Cascade Laminate, Mannington, Shaw, Mohawk, Coretec by US Floors, Du Chateau, Quickstep, and many more.